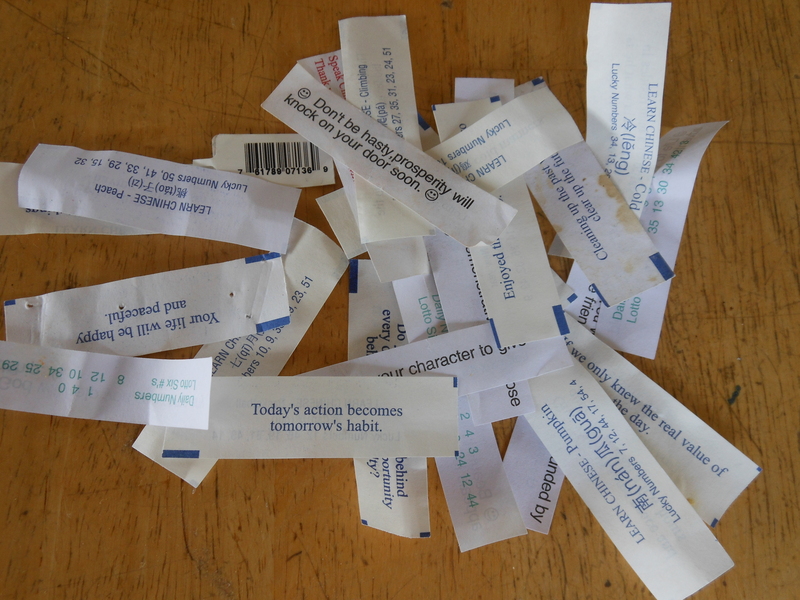 The other day I was cleaning out a desk drawer and came across a pile of fortunes that I had been saving over the past few months. For some reason, I don’t seem to be able to part with fortunes; I think it secretly has something to do with not wanting to break the chain of fate as I strongly believe in “what goes around comes around”. 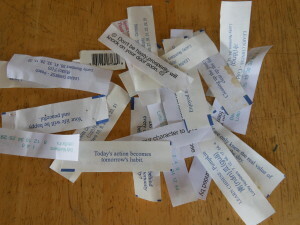 After weighing what to do with all these pearls of wisdom, I decided that if I “pay it forward” and share my wishes of good fortune, then I would be able to toss those itty, bitty pieces of paper without guilt; this way maybe good fortune will still rain down upon me. Here are my top 10 fortunes that I’d like to pass on to you. Today’s action becomes tomorrow’s habit. Enthusiasm is contagious; not having enthusiasm is also contagious. There’s no boosting a man up the ladder unless he’s willing to climb. Do you see difficulty behind every opportunity or opportunity behind every difficulty? Winning isn’t everything but the will to win IS. Cleaning up the past will always clear up the future. It is not in your character to give up. Don’t be hasty, prosperity will knock on your door soon. I will continue to collect these fortunes (as fortune cookies are one of my favorite treats 🙂 ), but by sharing them with others, I know I will no longer have to worry about breaking the chain of fate AND I will be the better for paying it forward. Do you have something that brought you good luck that you can share with others? Share it in the comment area below to pay it forward. ← PERFECT vs. IMPERFECT: Which is more memorable? WOW- Those Chinese fortunes were sure a lot better than the one’s I’ve gotten! I know I tend to save lots of little pieces of paper, old video tapes and TONS of books filled with writing I’ve done. You being an professional organizer, will know instantly, that my office is a disaster! (which can be very stressful, and I certainly write about that!). So I’m particularly proud of myself because I’ve begun scanning in my papers, and organizing them in folders. It makes me feel so much better than “worrying” about where things are, and wasting time! So your #6:”Cleaning up the past will clear up the future” is probably the fortune that I resonate with the most- at least today! How great for you that you’ve decided to attack your paper piles! I find that #6 Cleaning up the past will clear up the future works in so many different aspects of our lives. Glad that it made an impression on you. Thank you for sharing. To help you on your way to an organized world, you might want to consider signing up to receive our blog posts directly as well as our upcoming monthly newsletter (target date is June 30th). If that interests you, you can click on the link here to do so.